ILLUSTRATION: NOAH KROESE: γειά σου! Money talk, like sports talk, is often Greek to me. But the situation in Cyprus is definitely an exception. My understanding of the situation is as follows: Banks in Cyprus positioned themselves some time ago as a financial destination by offering fairly high interest rates to foreign depositors and investors. Several of these Cyprus banks then invested heavily in Greek bonds. They had a bad time. 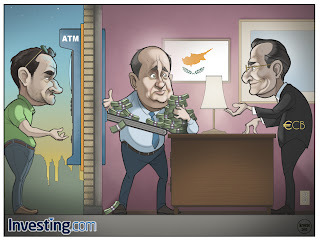 Now, with the money gone, Cypriot banks need a bailout from the European Central Bank (ECB). The ECB, which is understandably worried about recouping bailout money, wants money up front before they agree to help out. 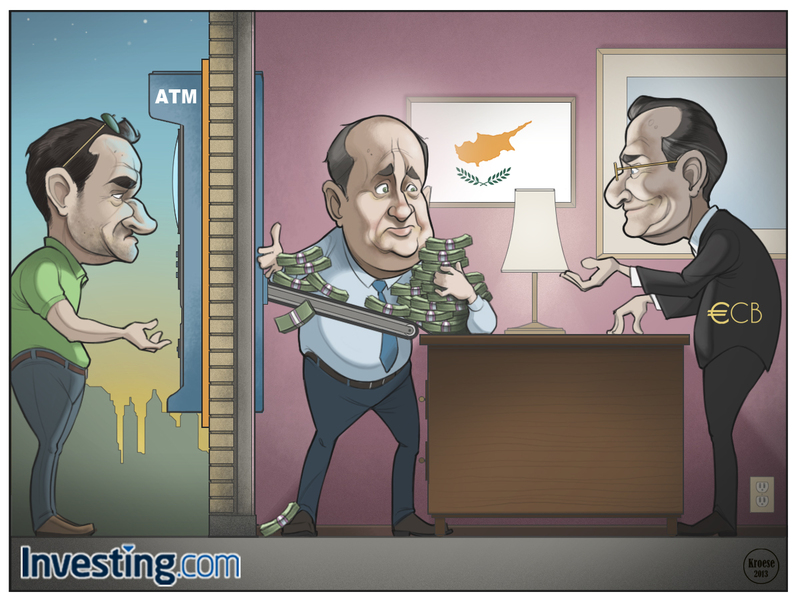 Without many options, Cypriot banks have decided to tap the savings accounts of customers with over 100,000 Euros (maybe as much as 40%). Many of these high-asset customers are likely wealthy Russians who were lured to Cyprus by the high returns from years ago. So these days, many people with their money in these banks are waiting to have a big bite taken out of their Euros (it sounds like "gyros" if you say it out loud...heh heh...sorry). So, if you're still reading, that's what this comic is about. 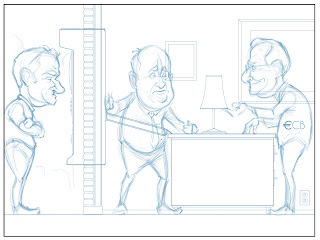 Now, down to the illustration: This is the first comic I've done for Investing.com in a couple of weeks, so wanted to come back strong (the idea, BTW, was thought up by the folks at Investing.com, as always). I made a genuine effort to avoid some of the things that have bothered me about past financial comics of mine. Specifically: uninteresting faces and boring lighting. To avoid these, I found some interesting face references (faces with lots of character) and went with a lighting source I haven't used in these comics before. The result is, I think, pretty decent. Ultimately, I ran out of time, but I'm still happy with the finished product. Favorite parts: The blue lighting on the customer's face from the ATM screen, the dusk background, the sad expression on the bank manager's face, the lighting inside the office. 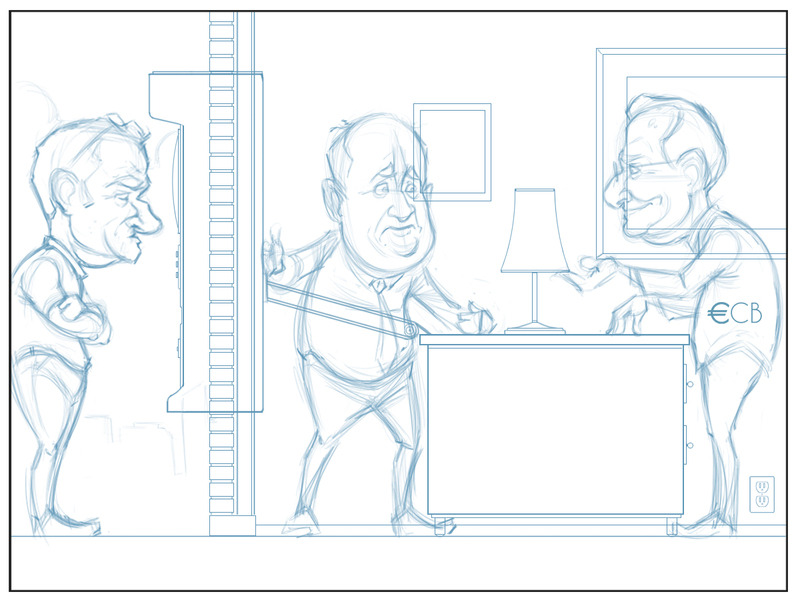 Least Favorite parts: The bank manager's right hand (the perspective and size are off a bit), the lamp (it's flat). Overall, I would consider this one to be a win.